Several studies on the effects of inhibitors of dopamine transporter have been interpreted as supporting the hypothesis that an effect of these inhibitors is to move dopamine from a storage to an available pool [47-49]. In some of these studies, amperometric techniques have been used to measure the increase in extracellular dopamine in the striatum elicited by stimulating dopaminergic neurons at supra-physiological rates. After pharmacological inhibition of dopamine synthesis, the amount of dopamine elicited by such stimulation declines much more rapidly than the decline in total tissue dopamine. 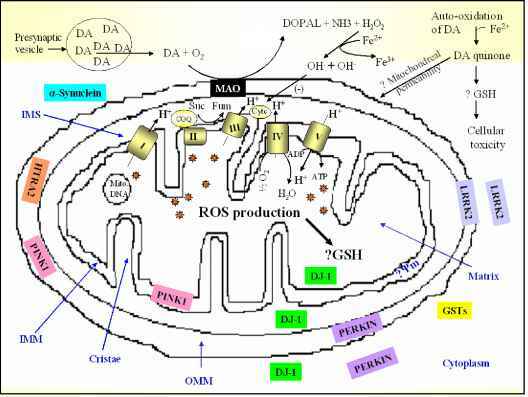 If an inhibitor of dopamine transporter is then added, the increase in extracellular dopamine elicited by stimulation at supra-physiological rates increases to near control levels. One interpretation of these results is that inhibition of the transporter causes movement of dopamine from a storage pool to an available pool. We have recently published an alternate interpretation of these results derived from simulations of the studies . A kinetic analysis of dopamine movement by dopamine transporter is necessary for understanding these new interpretations. When the number of dopamine molecules in the extracellular space is less than the number of dopamine transporters, the rate limiting step for transport is the rate of binding of dopamine to the transporter. When the number of dopamine molecules in extracellular space is greater than the number of dopamine transporters, the rate limiting step in transport is the turnover rate of the transporter. The rate of binding is faster than the duration of the transport cycle. Therefore, at smaller numbers of dopamine molecules in extracellular space, clearance rate of dopamine is faster than at higher numbers of dopamine molecules in extracellular space. Under baseline conditions, the number of dopamine molecules involved in each secretory event is much smaller than the number of dopamine transporters, and binding of dopamine molecules to dopamine transporters is the rate limiting step in dopamine clearance. When stimulating dopamine neuron firing rate at supra-physiological rates, the amount of extracellular dopamine increases roughly in proportion to stimulation rate until the number of dopamine molecules in extracellular space matches the number of dopamine transporters. As stimulation rate increases beyond this point, the rate limiting step becomes the slower turnover rate of the dopamine transporters and stimulated levels of extracellular dopamine increase to values much greater than proportional to firing rate increase (Figure 7). In this experimental paradigm, inhibition of dopamine transporter is functionally equivalent to decreasing the number of available transporter molecules. In the presence of an inhibitor of dopamine transporter, the curve relating increase in extracellular dopamine to stimulation frequency lies above that for the control condition (Figure 7). Figure 7. Effects of dopamine neuron stimulation frequency on elicited increase in extracellular dopamine. The circles show data from simulations  that provide an output that is a good match to data published by Garris and Wightman . The squares show simulation output for a model in which a competitive inhibitor of dopamine transporter is added to extracellular compartment. After inhibition of dopamine synthesis, dopamine stores are decreased. This results in fewer dopamine molecules secreted to extracellular space at each stimulation pulse. The functional effect is a decrease in rate of dopamine secretion, which can be visualized as moving to the left along the control curve in figure 7. For example, under the control condition, stimulation at the 60 Hz rate will increase extracellular dopamine to about 3 ^M. When dopamine stores are depleted by 33%, the same stimulation rate is now effectively the same as a stimulation rate of 40 Hz under control conditons, and the increase in extracellular dopamine is about 0.5 ^M. 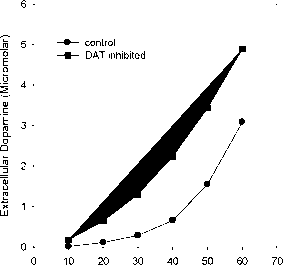 When an inhibitor of dopamine transporter is now added to the system, the increase in extracellular dopamine as a function of stimulation frequency is given by the upper curve of Figure 7. For the 40 Hz stimulation (actual effect of 60 Hz with 33% dopamine depletion), the increase in extracellular dopamine now jumps to more than 2 ^M. Thus, the transporter kinetic explanation can explain the experimental results without need for inhibitors of dopamine transporter moving dopamine between storage compartments.